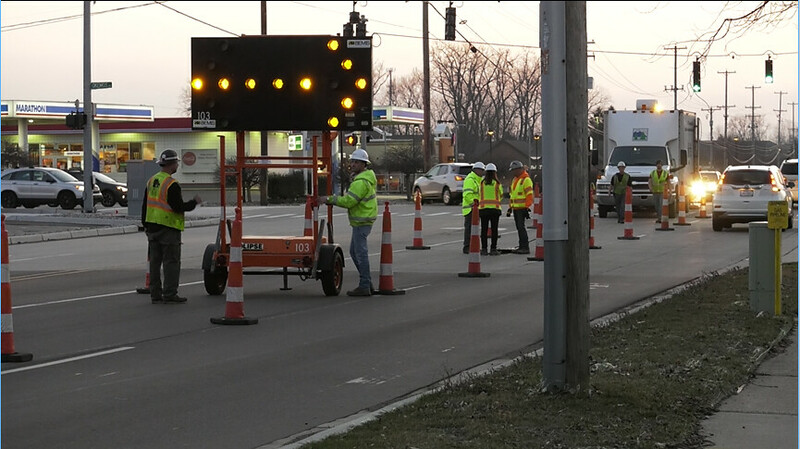 OKEMOS - On April 5 at 7 pm lane closures took effect at the Jolly Road and Okemos Road intersection. The reason for these closures were to inspect and fix a corroding pipe along the intersection. This caused a shift of traffic, however roads were open and road surfaces were not disturbed. Lane closures were in effect from Friday evening to Monday early morning at 6 am, however work completed between 3-4 pm on Saturday and workers were ahead of schedule. "We are going to be shutting down on Westbound and Eastbound lane on Jolly Road and the right turn lane coming from the North on Okemos Road that is part of that process we need to get in two manholes and clean about a 80 foot section of pipe and then put fiber glass liner in that pipe so that we can be assured that it will last for many years to come." "We have the liner in place underneath the pipe in the intersection and the liner itself has a resin in it and to hear that resin and make it a hard and durable liner we have to put hot and boiling water in the liner and basically cook it for about four hours and then when that's done we can pull all the hoses out and let it cool for about three hours. Once it's cooled down we can pack everything up and cut the upper part of the liner and the other side and get the water flowing and then we will have a fifty-year solution." The workers were successfully able to clean the corroding pipe and any other obstruction for more efficient water flow from the Jolly and Okemos Road Intersection to the Smith Drain.